"I've spent a lot of time in the water with the orca and never seen mucus coming from their eyes when in the water with them, nor when photographing them up close from the surface - but then the orca are moving and the mucus is clear - so it would be hard to spot. However, I have seen it on stranded orca (and pilot whales, beaked whales, Bryde's whales, bottlenose and common dolphins), which makes sense, because the eyes are then out of the water and they are trying to moisturize their eyes and expel dust and sand, for instance." Spikes in chlorine concentrations can be especially troublesome for both whales and trainers. Former Seaworld trainer John Hargrove spent time working at Marineland Antibes in France and told me about a chlorine overdose there that was so intense it seemed to prevent the killer whales from opening their eyes, and the skin on their heads and backs started peeling off. Another trainer's eyes were burned so badly that he had to wear bandages that completely covered his eyes and shut out all light. According to Hargrove, he wasn't allowed to open his eyes until more than a week had passed for fear he risked permanent blindness. "There are dozens of documented reports of serious eye burns to trainers because there was an over-injection of chlorine in the pool, and as the whale underwater foot-pushed us through this cloud of intense chlorine, we had eye burns so severe we often couldn't even open our eyes. I was treated at least half a dozen times where I was I was sent off site for treatment, and could barely open my eyes because of the pain and wasn't allowed to do waterwork again for 2-3 days until they healed [enough] to swim again." "That was just from our brief exposure," Hargrove says. "Imagine the whales always having to swim through it." The mucus secreted by the eyes of the killer whales -- whether it's triggered by chlorine, more frequent exposure to the air, or other factors of captivity, like looking up into the sun more often, or even all of the above -- appears to offer some protection. 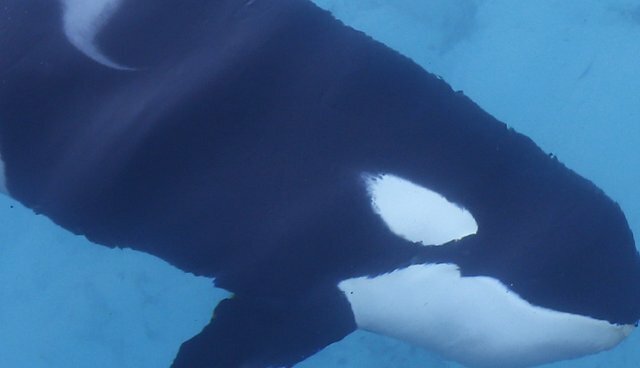 There is no obvious trend (according to the trainers I have spoken with) of older killer whales predictably developing sight problems in captivity. "[C]aptive pinnipeds are frequently housed in pools painted a light blue color which is very effective at reflecting most of the UV light energy back towards the animals as they dive and swim. As well, captive pinnipeds are often housed in deep grottos or pools where they must look up frequently to see out of the exhibit or to catch fish.... When keepers, trainers, or members of the public feed the animals they may inadvertently force the animals to look directly into the sun to get their fish reward. These conditions may cause damage to the eyes of captive pinnipeds because they are forced to be exposed to far more UV light than their wild counterparts. This is supported by studies such as a recent publication that identified pinnipeds with no access to shade were 10 times more likely to develop cataracts or lens luxations."